Larger Project 4-4, Living Room » Roger Perron Inc. This is a photo of the living room, which is a two-story space with a multifaceted ceiling design. The room is round with custom stone floor design. The windows are natural mahogany wood species custom made with clear finish. 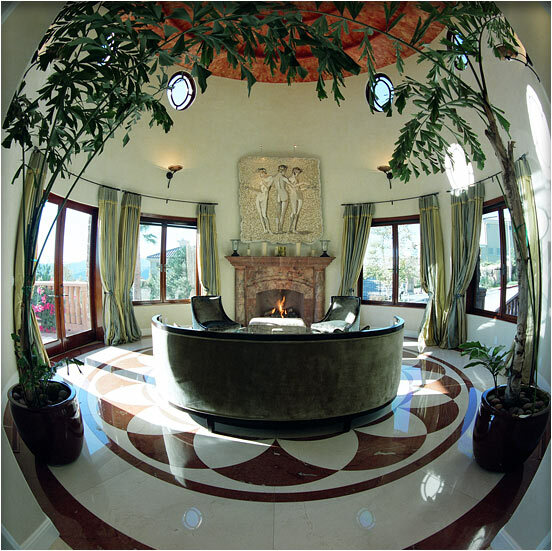 The walls and ceiling finish are Venetian plaster with several colors mixed in. The fireplace is precast concrete. The mural over the fireplace is a template of a sculpture recovered from Pompeii.